Kyle Rayner is in trouble with the League for failing to respond to a JLA summons. Granted, he's still new at the whole hero deal, being at it only six weeks. Taken to task, the JLA questions his commitment to his duties. Chagrined, he reflects on how he became Green Lantern. One night in a seedy part of town, a mysterious blue midget appears and gives him a green ring, a ring that shortly thereafter grants him the powers of the Green Lantern. As he experiments and rescues a missing Power Battery from the Order of St. Dumas, he comes to the attention of the Justrice League. It is Superman that officially welcomes him into the world of super heroics, explaining to him, as best he can, what's happening, and taking him to the Watchtower, where he is met with mixed emotions and granted provisional membership. Somewhat shellshocked by it all, he barely has time to adjust before being summoned to deal with Dr. Polaris. He does so, but makes a nearly fatal error in the process. Only Superman prevents him from being guilty of negligent homicide. As he is summoned for disciplinary action, the Watchtower vanishes before his eyes. The Justice League has simply disappeared. Kyle soon finds himself on the recieving end of one of Batman's investigations. Batman comes to the reluctant conclusion that Kyle is not responsible for the League's vanishing, but tells Kyle that he may be the only one who can save them. Kyle heads home, and is soon shocked to realize that Ganthet, the Oan that gave him the ring, was inside of it. Ganthet explains that his fellow Oans are attempting to, in essence, erase all of the universe, save perhaps one billionth of one percent of all life in the galaxy. And only Kyle, a completely inexperienced hero and Green Lantern, can stop them. Soon, Kyle finds himself training hard to be the best Lantern he can be, but to save the universe, he must discover what happened to the League, master his power, undo the machinations of the oldest sentient race in existance, and cross paths with his immediate predecessor... HAL JORDAN! Story - 2: This novel doesn't fit the mold of the other JLA novels. Simply put, it's Kyle's full origin, taking place far before any of the other novels. It isn't a JLA story, but a Green Lantern story, and a confusing one at that. It relies heavily on metaphysics, pseudo science, and philosophical wonderings so completely beyond human understanding that it hurt my eyes just to READ them. When you're going over the heads of your audience, it's safe to say you're trying way too hard. Superman fans won't have much to look for here, either. Aside from some very brief Kyle-imagined action early on, Superman's only function is to serve as an example of how much Kyle needs to learn. I also simply don't buy that Superman is "hardwired" to not be selfish on a genetic level. That's simply rubbish. It was how the Kents raised him, not something in his DNA. Plus, as I said above, it's simply NOT a JLA story. And I don't understand why. The Green Lanterns have their own trilogy, "Sleepers", currently being published. There's simply no reason to shove Kyle's origin into a series meant to focus on a full team. It's supposed to be equal play for all, but Kyle hogs the spotlight entirely. I do, however, enjoy the explanation for the existance of metahumans. Suitably overthought, given the story, but it didn't have to be there, and it's inclusion explained why the JLA got written out of their own book. 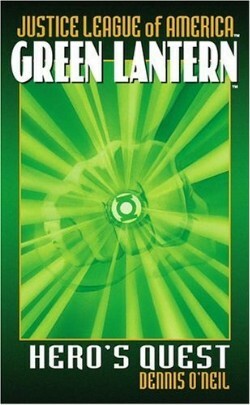 Cover Art - 3: It's Green Lantern's fist. Possibly the WRONG Lantern's fist.�It's glowing green, of course. And it's recycled art. Ah well, it's still dynamic.